Grilled Scallops, Avocado Sauce, Thyme for Cooking summer main course. 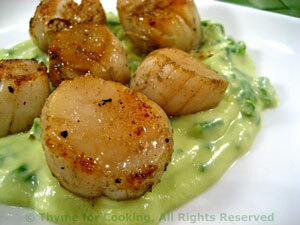 With the sweet scallops and creamy avocado, this is a rich dish.... I served fewer scallops than usual. Use a grill pan or basket for easy handling and be careful not to overcook. Mix oil, cumin and lime juice. Add scallops and stir to coat. Purée avocado, yogurt, lime juice and chicken stock in a blender until smooth. Grill scallops over direct heat 3 - 5 minutes per side, just until they are opaque. To serve: Divide Avocado Sauce and spoon onto 2 plates. Arrange scallops on Sauce and serve. Note: Wrap remaining avocado half in cling film, place, cut side down, on a plate and refrigerate.